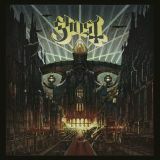 Since Ghost’s first album Opus Eponymous was released in 2010, the band has seen a massive surge in popularity, but also has drawn out a lot of haters. A recent interview with Blabbermouth even shows big metal names like Kerry King who simply can’t stand the music, but made sure to get across that these “Nameless Ghouls” and good old Papa Emeritus were the nicest guys around. To be clear though, Meliora continues down a more progressive hard rock path with metal influences. If the line I stood in last week to get into the concert at the Newport Music Hall in Columbus Ohio says anything, it’s that Ghost have a stronger following than ever before. Meliora is simply Ghost’s best album to date, infusing many of the great elements from both Opus Eponymous and Infestissumam. Spirit opens the album up in a haunting yet cartoon-ish manner, sounding very Halloween-esque for this time of year. However, it wasn’t the strongest opening song I was coming to expect. A good rumble from the drums at the start sets the song up forming a simpler groove from the instruments. From the Pinnacle to the Pit begins with an attractive bass line, leading up to more lead driven riffs. The album does steadily grow heavier with each passing song, probably the heftiest sound Ghost has achieved thus far in their career. Cirice is perhaps the most recognized song of the bunch, starting off with acoustics guitars, giving off a creepy tone, but contains a pounding riff, that may be one of their heaviest songs yet. Vocals are solid as ever with Papa III at the mic, most notably in He Is. His voice (still hanging off the Blue Oyster Cult feel) is layered very beautifully in this one, creating an extremely powerful and memorable experience, one that is their first to be centered on love, done so with the satanic themes very much intact. Mummy Dust brings Meliora back into full swing, with a tougher riff this time around. The instruments really clash to create a sound that I can only explain as truly grand, but it also delves into a darker atmosphere during the chorus. But the rock is still heavily present, especially within Majesty, which brings out a solid crunch of it. Ghost has captured a sound that I can only describe as extremely accessible to many audiences. Though I can see much loathing from the most hardened of metal elitists (but of course this is firmly a rock centered album), Ghost have made quite a lot people happy over the last five years, and there isn’t much in the way of them slowing down anytime soon.